I used to say that Tiny Saints started the way all things start: someone got an idea. For my family, this doesn’t seem to fully capture the story behind these little products. On October 7, 2011, my wife, Colleen, officially reached the 9-month mark carrying our third child, Melody Paige. On what we hoped would be an exciting day, I saw concern growing on my wife’s face as she felt a stillness from Melody that she hadn’t felt before. She insisted that, just to be safe, a trip to the hospital might be a good idea. 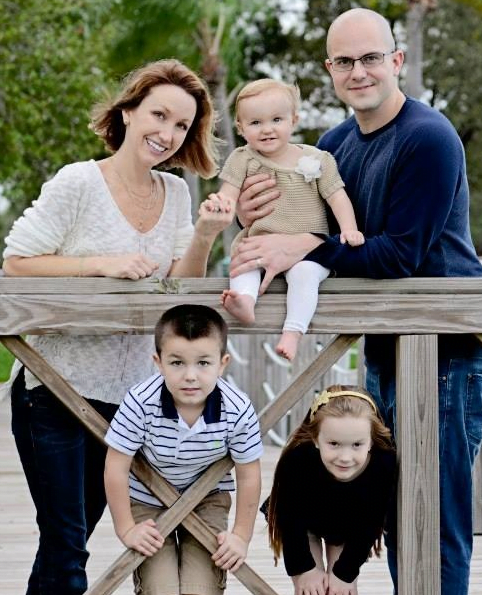 The news was devastating as we found out that Melody did not have a heartbeat. There are a million things to say about the loss of a child. I can only speak of my own experience and what it felt like to lose my daughter just before birth. I pray often for those who suffer similarly. To this day, Melody is extremely present in our lives. She is always a reason for tears, but Melody is also one of our greatest sources of joy. I believe much of that has to do with the story of her influence in our lives. of something that even we didn’t understand: Heaven. We noticed that it was the concept of the saints that seemed to peak the kids’ interest, so we started learning more about the saints. We read their stories, and we picked our favorites. We started searching online for images of the saints to show our kids. It was fun, but the images and stories of the saints weren’t resonating with the Gracie and JT beyond a first glance. Our kids weren’t getting to know Melody’s friends the way they wanted to, so we sat down with the laptop and started making tiny, simple images the kids could get excited about in a cartoon style to which they could relate. and the saints were all playing dress-up in Heaven’s biggest closet and catching frogs near the rivers! They were doing the things living children do every day. Unexpectedly, we found ourselves embracing in a new way the single most important, magnificent, and beautiful reality tied to Melody’s death: Melody is very much alive! of charms came in and we sold out in less than a month. A few months after that, my brother, Mark, and his wife, Megan, joined the Tiny Saints team. Tiny Saints would not be what it is today without the enormous sacrifices of those two very important people. We started an online store in early 2013, and within a few weeks we were available online in 10 more stores, followed soon by bookstores and gift shops across the country- about 175 to date! Probably one of the most exciting experiences has been going to different shows and venues to showcase and sell Tiny Saints. We’ve been to Houston, Indianapolis, and Des Moines just to name a few. Every time we go to a show or venue, we leave even more inspired about the impact the saints have on the faith of so many, including us. of need, and even felt like I had relationships with a couple. However, through our little ministry and the graces surrounding it, I have come to understand more what the Church has been telling me for 33 years. The saints in Heaven are waiting for us to ask for their intercession and to pray to them. They are there cheering and interceding for us in the joys and sorrows of life, pointing us ultimately to Jesus. When I picture little Melody, she is telling me the same thing. 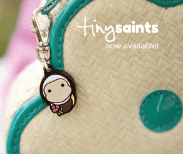 The Tiny Saints charms are a daily constant reminder that the saints in Heaven are on our side. 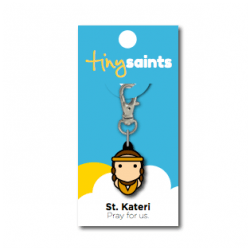 Each charm is an encouragement to know a saint in a more detailed way. The lives of the saints are timeless and cross all boundaries. We have within our Church history a rich and powerful tradition, but also examples of people who have fought the good fight and lived their lives for Christ. These are the examples that we want our children to see and emulate. We started out with just a few saint charms two years ago and now we have over 60, with more in the works. 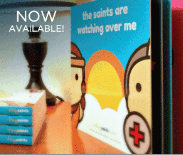 I recently wrote a children’s book, The Saints Are Watching Over Me, to show children that the saints are with us in our daily lives. Kids love the book and charms, sometimes collecting 5, 10, or 20 charms at a time. Adults often attach the charms to personal items such as necklaces, purses, and bags. It’s amazing how much a simple idea two years ago has changed and grown into a movement for people of all ages to embrace the saints. Our dream is that Tiny Saints goes around the world. We hope to one day create a curriculum for schools and religious education programs to introduce these powerful men and women to children. We also envision retreats and camps. 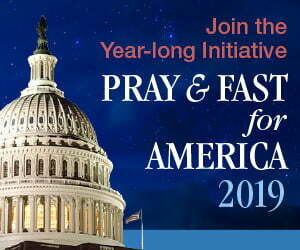 We don’t know where Tiny Saints will ultimately lead, but we do know that we are blessed to be a part of this mission. Melody’s time here on earth was short, but her impact on our life and Tiny Saints will never be forgotten.